Thursday May 3rd the Michigan Marijuana Facilities Licensing Board met and approved all three of the pre-qualification applications that were presented. Two of the applications passed unanimously and the other passed on by a 4-1 vote with Pickard being the only vote for denial. This would be the only board meeting so far where all the applications presented were approved by the board. The public comment portion of the meeting consisted of several individuals expressing concern over the boards’ ability to meet the June 15th deadline (see advisory bulletin) to approve or deny those applications submitted by businesses currently operating. If the pending applications are not fully approved by the June 15th deadline, all currently operating businesses will be forced to shut down preventing patients across the state of Michigan from obtaining medicine. This is not good news for medical marijuana patients who rely on provisioning centers to provide them with access to medicine. Near the close of the meeting, the board was offered an opportunity to make comments. One of the board members stated that those applicants who are not currently operating were at a competitive disadvantage. Then the board member then went on to mention that this is all really about money. Seconds later in what was a strange turn of events, the same board member then went on to say “this is for the patients” and repeated it several times. 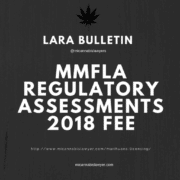 If the board members are truly concerned about the patients they will work with LARA (Licensing And Regulatory Affairs) and the BMMR (Bureau of Medical Marihuana Regulations) to ensure those businesses who are currently operating and have made a good faith effort to obtain a license should not be forced to shut down on June 15th because of the State’s deficiency in approving licenses in a timely fashion. So I pose a question to the entire board: why bring up money and competitive disadvantage when discussing what is in the patients’ best interest? State Board will you, for the patients, set aside any interests or concerns regarding money and competitive disadvantage and do what’s right by ensuring they have consistent safe access to medical marihuana? Josh, this is insane. Pandering to patients??? The MMMA bar association is EXACTLY a decade late for that. We get attacked, felonized, bankrupted and a million other HORRIBLE things for this to go thru. I applaud the BMMR jerk who said it is all about the money, he is telling the truth… AFTER ALL ONLY 3 PEOPLE HAVE HAD A MMMA DEFENSE SUBMITTED TO A JURY….